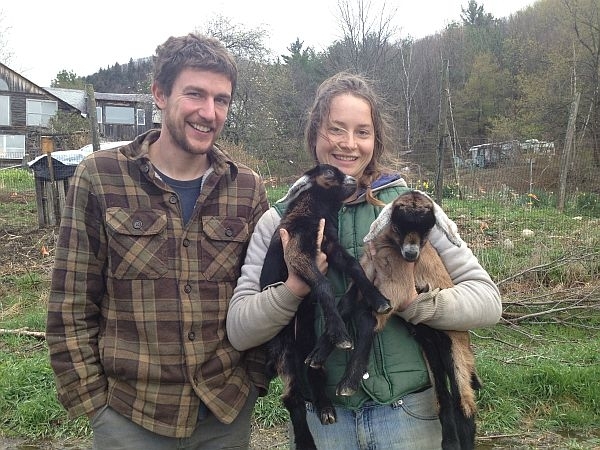 A growing number of Vermonters are using Kickstarter to raise money for specific projects. The crowd-funding website was launched in 2009 primarily to help artists and musicians. But today inventors, entrepreneurs and a growing number of farmers are using Kickstarter as well. Josh Brill and Meadow Squire grow vegetables and rice in Tinmouth. Last fall, they used Kickstarter to raise more than $6,000 to expand their rice production. Seventy-six people thought enough of the couple’s six-minute video and their dream to send money. Scott Nelson of Friendly Folk Farm in Brookfield wants to document the growth and development of his farm – to create a kind of how-to video for others interested in organic farming. He’s trying to raise $8,500 on Kickstarter and he’s just about there. In Tunbridge, Annissa Morrison hopes to raise $20,000 to save an historic barn. According to Yancey Strickler, one of the site’s founders, Kickstarter funding is "all or nothing." To raise money on the site, he says you have to have a specific, creative project in mind; one approved by the website. Strickler says it helps to post a video to explain what your project is and why people should support it. There’s also a deadline for raising the cash – typically about 30 days. So far, Stricker says 44 percent of projects have reached their goal successfully. From those, Kickstarter takes a 5 percent cut. Amazon shaves off another 3 to 5 percent in credit card processing fees. "So you need $5,000 in 30 days," explains Yancey Strickler. "Now, if that person is able to raise that $5,000 or more by the time of that deadline, at that point everyone is charged and that person gets their money and they go and they do their thing. If they come up short of their goal then no one is charged at all and everyone just walks away like nothing’s happened." If you’re surfing Kickstarter’s website and you see a project you like, Strickler says you can use your credit card to support it with whatever amount you want. "Now people choose to back projects because they get something in exchange – it’s not a tip jar, it’s not a donation platform." Every project has a list of rewards – goodies for various levels of support. Josh Brill and Meadow Squire gave supporters packs of seeds, rice they’d harvested, and good karma points. Forty-five hundred creative projects are currently seeking money on Kickstarter, about 50 are based in Vermont. Officials at the site say they don’t track farm-related projects, but with $3 million being pledged each week, it’s not surprising that farmers would want in. Walter and Holly Jeffries own Sugar Mountain Farm, a 70-acre spread in West Topsham where they raise pigs – 300 of them. The Jeffries have been in the pork business since 2003 and have a loyal clientele for their meat. The problem? Their van’s too small. "Right now, we drive – or I should say my wife drives down to Massachusetts and it’s a seven hour trip every week," Walter Jeffries says. Commercial slaughtering and butchering facilities are in short supply in Vermont, so his wife Holly has to drive to a meat processor 150 miles away. "It’s a long drive, it’s a lot of gasoline and it’s a lot of time," says Holly Jeffries. She adds that the pigs don’t like it much either. And because the van can only carry six pigs per trip, she says it limits the amount of pork the couple can sell. "We actually calculated that between the time of loading the pigs and driving down and spending the time sorting our orders that the butcher has done for us and beginning deliveries – in that same amount of time we could slaughter and cut the pigs ourselves." That’s when the couple decided to build their own USDA inspected butcher shop right on their farm? This sounds like the place Kickstarter comes in but not quite. Walter says first, he had to read through all the state and federal food safety regulations and navigate the permit process. When he and Holly were finally ready to build, they sought financing the old fashioned way from banks. But that was in 2008, the economy was in a free fall and the Jeffries got a fist full or rejections. So Walter says the couple went to their customers and offered pork pre-buys at a discount. "That was very popular. We have a lot of people did that and that provided us with a big chunk of change to buy concrete." They borrowed from friends and family and with their own savings they managed to get quite a bit of their 1300-square-foot butcher shop built. But says Walter, not all of it. "In the spring some customers suggested why don’t you try Kickstarter? This was in 2010. " But back then, Kickstarter was still primarily geared to artists and musicians and the website turned their butcher shop proposal down. "This winter another customer said, ‘Hey there’s a project on Kickstarter that’s just like yours!’ In fact it turned out that the project that was inspired by ours – these were farmers down in Pennsylvania and they had been inspired to farm the way we do by reading my blog for years." North Mountain Pastures in Pennsylvania raised $48,000 to build a small scale meat-curing facility on their farm. When the Jeffries saw that project on Kickstarter they approached the website again, and this time they were approved. With twenty days left, the couple says they’ve already raised more than three quarters of their $25,000 goal. "So, We’ll make it," says Walter. But Holly says, "We’ve got to keep pushing, we understand that. Kickstarter is a platform – but it’s really a matter of us getting the word out – letting people know it’s there. Vermont has a wonderful community who is really interested in local farming and they’re really interested in supporting agriculture that they believe in." Which may be why more and more farmers are successfully raising money on crowd sourced funding sites like Kickstarter. Back in Tinmouth, Meadow Squire checks on a pair of baby goats as her partner, Josh Brill, walks across the mud to point out new rice paddies they put in with funds from Kickstarter. "One of the key things that Kickstarter allowed us to do was reach out, having the video online and being able to link with Facebook," Squire says. "It really was free advertising for us. You know, so many people now know we’re growing rice and they know more about our farming practices because we do a lot of alternative agricultural practices and there’s already so much anticipation about the rice coming that we would not have had if we just had gotten a loan from a bank." Squire says it’s a buzz that should boost sales nicely this year. As twenty-somethings comfortable with social networking, they say Kickstarter was a lot less intimidating and more fun than seeking out a bank loan. And they say the feedback has been really inspiring, especially from other farmers. Josh Brill says one pledge came all the way from New Zealand. "When someone is willing to put up their money for your farm, that means something – it’s like you would feel bad if you couldn’t succeed for them." He’s not sure, but Brill says it’s doubtful he’d feel quite as emotional about a bank loan.